The National Bureau of Investigation (NBI) (Finnish: Keskusrikospoliisi (KRP), Swedish: Centralkriminalpolisen (CKP), lit. central criminal police) is a national law enforcement agency of the Finnish Police and the principal criminal investigation and criminal intelligence organization of Finland. The Bureau's main tasks are to counter and investigate organized crime, provide expert services, and develop methods for criminal investigation. NBI is also responsible for financial intelligence (FININT), such as preventing money laundering and terrorism financing. NBI headquarters has been situated in the city of Vantaa within the Capital Region since 1994 with field offices in Tampere, Turku, Mariehamn, Joensuu, Oulu and Rovaniemi. It is subordinate to the National Police Board under the jurisdiction of the Interior Ministry. 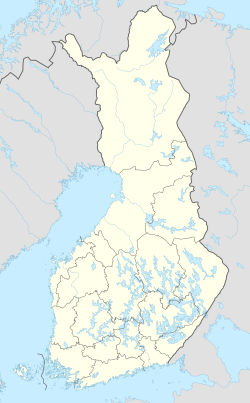 The National Bureau of Investigation (NBI) was established on 30 December 1954 upon ratification of Act 510/1954 and became operational in 1955 by merging the Uusimaa Province Crime Police Centre (Finnish: Uudenmaan läänin rikospoliisikeskus) and the Crime Research Centre (Finnish: Rikostutkimuskeskus). Previously, the Crime Police Centre had been handling nationwide investigations while the Crime Research Centre was in charge of intelligence and forensic analyses. Kosti Vasa was appointed NBI's first Director and served as such until retiring in 1965. In the wake of the 2004 Indian Ocean earthquake and tsunami, NBI's Finnish Disaster Victim Identification Team (DVI) was dispatched to identify Finnish victims in Thailand. 173 out of the 178 Finns missing in Thailand were eventually identified. In April 2013, NBI came under public pressure after it was revealed that the Bureau had collected mostly indirectly connected information of suspicious persons with possible links to organized crime into a secret intelligence database. Russian president Vladimir Putin was one of the persons recorded after his interaction with the motorcycle club Night Wolves. According to prosecutors, the database was lacking proper controls and vulnerable to unauthorized use. Reporters speculated in the media that having a record in the database could possibly cause financial losses and social exclusion for registered persons—who had no means to verify or be aware if they had been recorded. By April 2016, 97.3% of the nearly 50 000 entries had been determined legal and the rest deleted. Robin Lardot started as the Director on October 2013 and initiated an organizational reform by concentrating five of the former departments into three divisions and by reducing leadership positions. The reform was completed on 1 January 2015. Similarly, a new unit targeting cyber crime was established at the Bureau's headquarters in April 2015 with a preliminarily number of 45 staff. The unit's chief named concentrated cyber attacks as Finland's greatest threat at the time. In March 2015, the Bureau opened its first official Twitter account and in August 2015, opened its doors for the first time to the public and allowed visitors to see contents of the Bureau's Crime Museum as well as art forgeries kept inside its headquarters. NBI was in charge of investigating the Turku stabbing of August 2017; considered Finland's first suspected terrorist attack since the end of World War II. terrorist offences, unless agreed otherwise with the Finnish Security Intelligence Service. The Bureau states that it engages in different operational activities, such as detecting and preventing money laundering and terrorism financing, taking part in major disaster investigations through the Finnish Disaster Victim Identification Team (DVI), and coordinating combined PCB (Police Customs Border) criminal intelligence organised around the National PCB Criminal Intelligence Centre and the PCB Intelligence Units specialised in air, sea and land traffic. NBI hosts the national centres of Interpol, Europol and Schengen cooperation as well as develops new forensic investigation methods, equipment and material for the police force. The Criminal Investigation Division is further divided into sections on organised crime, homicide, financial crime and information gathering—and the Criminal Intelligence Division contains a separate section on international affairs as well as a Financial Intelligence Unit (FIU). NBI had 696 staff, of whom 39% were women, at the end of 2016. Most of the Bureau's personnel serve as law enforcement officers (60%) mainly in investigative and intelligence duties. Civilian staff include experts, such as chemists, laboratory assistants, clerks, engineers and linguists. ^ a b c d Keskusrikospoliisin toimintakertomus 2016 [2016 Action Report of the National Bureau of Investigation] (PDF) (in Finnish). Vantaa: National Bureau of Investigation. 2017. Archived (PDF) from the original on 2017-06-11. ^ Laki keskusrikospoliisista 30.12.1954/510. [Act on the National Bureau of Investigation 30.12.1954/510]. (In Finnish). ^ Hietaniemi, Tuija (2015-12-11). "Poliisitoiminnan historia, liike ja rajattomuus" [The history, movement and limitlessness of police action]. www.haaste.om.fi (in Finnish). Council for Crime Prevention and Ministry of Justice (Finland). Archived from the original on 2017-08-22. Retrieved 2017-08-21. ^ Sommar, Heidi (2010-09-27). "Rikostutkimuskeskus vuonna 1947" [The Crime Research Centre in 1947]. Yle Elävä Arkisto (in Finnish). Archived from the original on 2017-08-22. Retrieved 2017-08-21. ^ Kosti, Vasa (1967). Poliisimiehen muistelmia [Memoirs of a Police Officer] (in Finnish). Porvoo: WSOY. ^ "Suomalaispoliisi kertoo tsunamiuhrien tunnistamisesta: Lasten sormenjälkiä penslattiin piirustuksista" [Finnish police officer recounts identifying tsunami victims: Fingerprints of children were lifted off drawings]. Ilta-Sanomat (in Finnish). 2014-12-26. Archived from the original on 2017-08-22. Retrieved 2017-08-21. ^ a b "Turvallisuusympäristön muutos lisännyt tiedonhankinnan merkitystä – Epäiltyjen tietojärjestelmän ohjeistusta ja valvontaa kehitetään, rekisterissä ei ole ollut lainvastaisia tietoja" [Changes in the security environment have altered the significance of information gathering – The guidance and control of the suspicious persons registry will be developed, registry did not contain illegal information]. www.poliisi.fi (in Finnish). 2016-04-28. Archived from the original on 2016-07-14. Retrieved 2017-08-22. ^ "NBI: "No reason to suspect Putin of criminal connections"". Yle Uutiset. 2013-04-11. Archived from the original on 2017-08-22. Retrieved 2017-08-22. ^ "Krp:n Putin-merkinnällä luultua isompi yleisö" [NBI's Putin entry had a larger crowd than anticipated]. Helsingin Sanomat (in Finnish). 2013-04-15. Archived from the original on 2016-04-13. Retrieved 2017-06-17. ^ "Police chief: Putin on suspects' list by mistake". Yle Uutiset. 2013-04-10. Archived from the original on 2017-08-22. Retrieved 2017-08-22. ^ "Syyttäjä: Valvonta täysin laiminlyöty epri-rekisterissä – Syytetyt: väärät miehet käräjillä" [Prosecutor: Suspicious persons registry totally out of control – Accused: Wrong men on trial]. Yle Uutiset (in Finnish). 2015-12-09. Archived from the original on 2016-03-10. Retrieved 2017-06-17. ^ "Näkökulma: Vasta Putin puhkaisi mädän poliisirekisterin" [Opinion: Putin punctured the rotten police register]. Ilta-Sanomat (in Finnish). 2015-12-10. Archived from the original on 2017-08-22. Retrieved 2017-06-17. ^ Keskusrikospoliisin toimintakertomus 2015 [2015 Action Report of the National Bureau of Investigation] (PDF) (in Finnish). Vantaa: National Bureau of Investigation. 2016. Archived (PDF) from the original on 2018-03-02. ^ a b "KRP:ssä alkaa iso myllerrys - noin 20 päällikköä uusiin tehtäviin" [A large shift starts in NBI – approximately 20 chiefs will be transferred to new positions]. Ilta-Sanomat (in Finnish). 2014-06-18. Archived from the original on 2017-08-22. Retrieved 2017-08-22. ^ "Poliisin uusi yksikkö torjuu nyt kyberrikoksia – päällikkö pelkää kohdistettuja verkkohyökkäyksiä" [New police unit will counter cyber crime – chief fears concentrated cyber attacks]. Helsingin Sanomat (in Finnish). 2015-04-17. Archived from the original on 2017-08-22. Retrieved 2017-08-21. ^ "First message of @krp_poliisi on Twitter". twitter.com. 2015-03-18. Archived from the original on 2018-03-02. Retrieved 2017-08-26. ^ a b c d "National Bureau of Investigation opens doors to public". Yle Uutiset. 2015-08-29. Archived from the original on 2017-11-07. Retrieved 2017-10-31. ^ "Finnish police: Main suspect in Turku attack is 18-year-old Moroccan". Yle Uutiset. 2017-08-19. Archived from the original on 2017-08-19. Retrieved 2017-08-19. ^ "Turku knife attack assailant confirmed as asylum seeker". Helsinki Times. 2017-08-19. Archived from the original on 2017-08-19. Retrieved 2017-08-19. ^ 9 §, Laki poliisin hallinnosta Archived 2017-08-22 at the Wayback Machine (14.2.1992/110) [Act on Police Administration]. (In Finnish). Retrieved 2017-08-21. ^ "Prevention of terrorist financing". Financial Supervisory Authority of Finland. 2015-12-15. Archived from the original on 2017-11-07. Retrieved 2017-11-03. ^ "Poliisi – NBI Mission". www.poliisi.fi. Archived from the original on 2017-08-03. Retrieved 2017-08-21. ^ a b "Poliisi – Financial Intelligence Unit". www.poliisi.fi. Archived from the original on 2018-03-02. Retrieved 2017-10-31. ^ "KRP muuttaa uuteen taloon Vantaalle 1994" [NBI will move into new Vantaa building in 1994]. Helsingin Sanomat (in Finnish). 1992-12-17. Archived from the original on 2017-08-22. Retrieved 2017-08-21. ^ "Poliisi – National Bureau of Investigation". www.poliisi.fi. Archived from the original on 2017-07-09. Retrieved 2017-08-21. ^ "Poliisi – Contact information". www.poliisi.fi. Archived from the original on 2017-05-20. Retrieved 2017-08-21. ^ "Poliisi – Rikosmuseo" [The Crime Museum]. www.poliisi.fi (in Finnish). Archived from the original on 2017-07-04. Retrieved 2017-08-21. ^ a b "Poliisi – NBI Organisation". www.poliisi.fi. Archived from the original on 2017-05-20. Retrieved 2017-08-21. This page was last edited on 19 December 2018, at 10:59 (UTC).